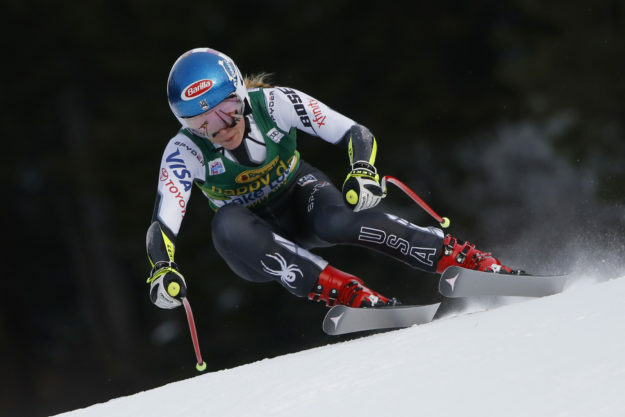 EagleVail’s Mikaela Shiffrin won the 46th World Cup race of her career on Sunday — a super-G in Lake Louise, Canada — while closer to home Park City’s Ted Ligety turned in a top 10 finish in the Xfinity Birds of Prey World Cup giant slalom at Beaver Creek. Mikaela Shiffrin (Avon, Colo.) has proven once again that she is the best athlete in the world with a historic FIS Ski World Cup super-G victory in Lake Louise, Alberta, Sunday as she became the first ski racer ever to win in all six World Cup disciplines – slalom, parallel slalom, combined, giant slalom, super-G, and downhill. With her 46th career World Cup victory – and her first super-G World Cup win – she moved into a fourth-place tie with Austria’s Renate Götschl on the all-time women’s World Cup win list. Only teammate Lindsey Vonn (Vail, Colo.) with 82 victories, Austria’s Annemarie Moser-Pröll with 62, and Switzerland’s Vreni Schneider with 55 are ahead of her on the all-time victory list. With three top 10 results in the past three days, including eighth in Friday’s downhill and fourth in Saturday’s downhill, Shiffrin increased her overall World Cup lead to 238 points over Switzerland’s Michelle Gisin, who currently sits in second, and Austria’s Nicole Schmidhofer in third. Up next, the women’s tour moves back to Europe next weekend (Dec. 8-9) with super-G and parallel slalom events in St. Moritz, Switzerland. Both events will be broadcast and stream live on the networks of NBC, including the Olympic Channel – Home of Team USA – the NBC Sports Network, and the NBC Sports Gold app. Tommy Ford (Bend., Ore.) was 15th as McLaughlin (Waitsfield, Vt.), who made his World Cup debut at Birds of Prey last season, finished 18th to score his first World Cup points. Ryan Cochran-Siegle (Starksboro, Vt.) continued his impressive skiing, finishing 22nd and scoring World Cup points in his third discipline so far this season. First-year U.S. Ski Team member and Ski & Snowboard Club Vail alumnus Kyle Negomir made his World Cup debut on familiar grounds as part of the seven-member U.S. Team to start in Sunday’s race. Up next, the men’s World Cup circuit moves back to Europe with giant slalom and slalom races in Val d’Isere, France. Both events will be broadcast and stream live on the networks of NBC, including the Olympic Channel – Home of Team USA – the NBC Sports Network, and the NBC Sports Gold app.